A rooflight can be defined as a clear or translucent structure designed for use on flat or low-pitched roofs, to allow natural light into buildings whilst maintaining the integrity of the building envelope. A huge variety of rooflights and rooflight systems are available in today’s marketplace, offering a wide range of characteristics to suit different building types. In the UK, rooflights are subject to UK Building Regulations. Consulting NARM members for technical advice is your assurance of being provided with accurate and up to date methods of how to comply. Glass rooflights are often the preferred solution for domestic, commercial and retail applications where aesthetics, high performance and long working life are key considerations. Polycarbonate sheet provides extremely high impact resistance and can be cold bent or thermoformed, making it suitable for rooflighting applications where curved glazing is a requirement. GRP sheet is the material of choice for profiled rooflights to match steel or asbestos cement profiled sheets used in the construction of factories and warehouses. Glass offers the rooflight specifier an extremely wide range of options in terms of performance, function and aesthetics. Glass is often the preferred material for domestic, commercial and retail applications, where aesthetics, high performance and long working life are key considerations. Glass has excellent fire properties, good impact performance, very high light transmission and provides the mark against which the optical clarity of all other glazing media is commonly compared. It is widely acknowledged as having a very long life expectancy with no discolouration from UV degradation, and laminated versions provide a good level of reduction in UV transmittance. 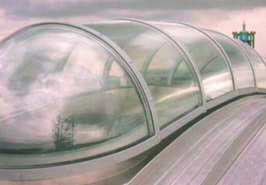 Glass can also be curved for use in barrel vault rooflights and supplied with various coatings, interlayers and surface treatments to provide coloured or textured surfaces to achieve obscure or diffused glazing, solar control and total UV protection to areas beneath the glazing. The key properties of polycarbonate are common to all forms – exceptional impact resistance, high levels of light transmission, good workability and good fire rating. All are commonly available in clear and tinted options, with clear and most tints providing direct light, while clear patterned and opal tint provides diffused light and gives a soft quality to the light. Co-extruded UV protection eliminates up to 99% of UV radiation, protecting materials and people beneath it. Each form also has its own particular characteristics and properties. Solid polycarbonate offers good optical clarity and superb workability. It can be cold curved on site and is suitable for use with a variety of glazing bar systems. Polycarbonate is a thermoplastic material, so it can be easily formed into 3D shapes, making it the ideal choice for domes, pyramids and barrel vaults. Profiled polycarbonate matches profiled roof cladding and allows the sky above to be seen through a corrugated material, a feature popular with many designers. It has very good profile accuracy and is available in a growing profile range. Extrusion and vacuum forming techniques allow a huge variety of profiles to be produced. Multiwall polycarbonate is an insulating glazing material. Thicker sheets with more walls achieve the highest thermal performance, typically 1.6W/m2K for a 25mm five wall sheet. Structured polycarbonate is most commonly used in most domestic and many commercial conservatories. Like solid polycarbonate it can be cold curved on site, although to a much lesser degree, it can be used in a variety of glazing bar systems, and has a very high strength to weight ratio making it ideal for the creation of glazing features. Other thermoplastic glazing materials such as PVC are still available, although these are generally not recommended for use in building and construction and may not achieve compliance with standards and regulations. GRP sheet is the material of choice for factory and warehouse rooflights. GRP remains the most versatile and commonly used profiled glazing material. 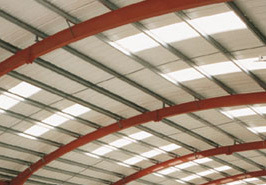 Available to match virtually any metal or fibre cement sheet profile and ideal for barrel vault design. GRP offers excellent performance properties and provides high levels of diffused light into the building. In most industrial, sporting and commercial situations diffused light, which minimises glare and distracting shadows, is preferable. GRP sheets are produced in almost all profiles, and modern high quality GRP sheets incorporate UV absorbing surface protection which can virtually eliminate long term discolouration. 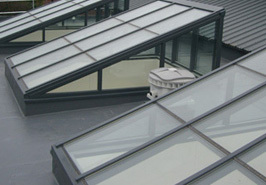 In a very budget conscious world GRP is a very cost effective rooflight material.